These stunning indoor & outdoor string lights feature LED bulbs cleverly shaped to mimic traditional Christmas tree lights. The extended reflector design makes the light from each bulb spread more evenly around than regular LED bulbs and, because they are LEDs the bulbs are both bright and also energy efficient! LED bulbs don't blow or need replacing like old bulbs and are far more energy efficient than traditional string light bulbs and typically last for a stunning 100,000 hours of constant illumination. This multi-functional set of stringlights can be set to a variety of different light displays including flashing, chasing, fading and plain-old 'on' modes and with 180 bulbs spread over around 18m, there's plenty of twinkling to be wrapped around your tree, house or garden! 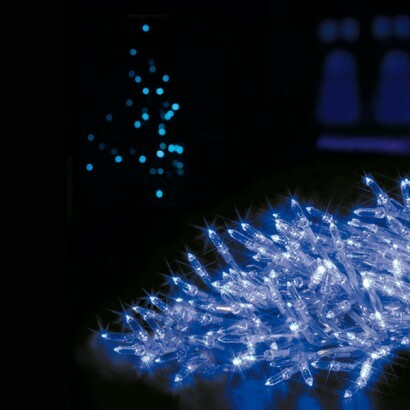 Available in stunning winter blue, these all weather string lights are sure to bring some light into your home or garden. The cable is green and bulbs are transparent which makes them discreet when they're off but LED bulbs emit a very vibrant and colourful light which looks dazzling in the dark! note: These all-weather string lights can survive the elements when strung up outside, but the mains transformer can't. The transformer needs to be kept indoors or in an IP44 rated weatherproof enclosure. Excellent. Worked very well and looked stunning. Does what it says on the box! Really, they're SUPER bright blue/ Great value and look awesome with the pink LED lights. Never let down by a purchase from Glow. These lights were competitive and just as described. Have ordered from the glow company in the past, and as before, am totally satisfied with the products and delivery.